It definitely looks like there is a projection issue with one of the pieces of data. Whenever I have similar issues, the first step I take is to locate which of the two is actually in the correct location. The easiest way to do this is to load in a dynamic map to provide a reference for where things are located. To load in a dynamic map, select "Add online maps" from the "Web" menu and choose "World Imagery" or "World Street map". SMS will display a dynamic map that updates when you pan around and zoom into the display. After you have located which one is correct, double check the specified projection on the one that is wrong by right clicking on it and checking the object projection. If the object projection of the object in the incorrect location seems correct, then more investigation is needed from the source of that data. Sometimes there are conversion factors such as a shift or scaling that must be applied, speaking to the surveyor or person that generated the data can sometimes clear that up. If after investigating the source of the data doesn't resolve the issue, then a trial and error process of manually shifting the data by applying either scale factors or X and Y shifts will be required. 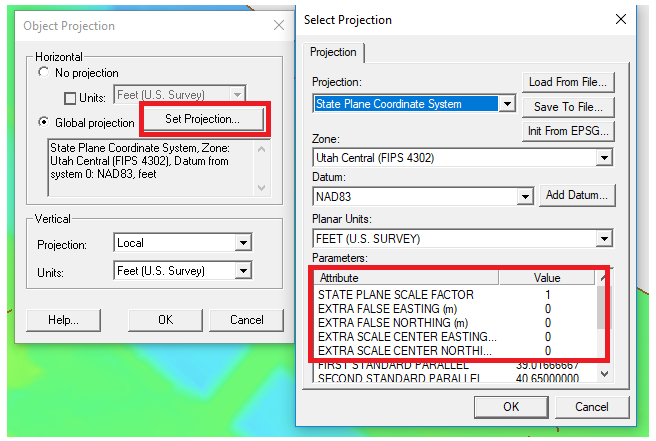 Most projections parameter fields that you can adjust within the projection (see below). Thank you for your reply. According to your given information, I loaded a dynamic map and saw that object projection is incorrect. I think, surveyor made a shift of co-ordinate. 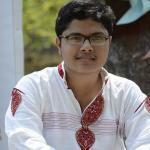 I came to know that, there is a different projection system for my country as it falls into two UTM zone. How can I add this new projection named BTM( Bangladesh Transverse Mercator) in SMS ? Additional information need to be provided. 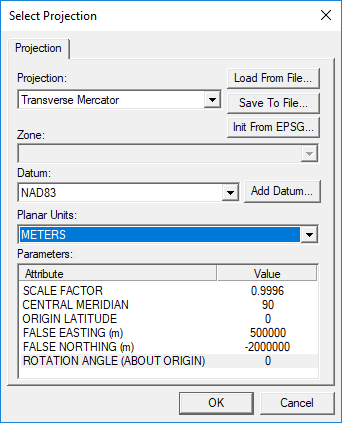 You can set the projection by selecting "Transverse Mercator" as the projection and then entering the projection information that you have listed (see below). The datum you have listed does not appear to be in the library list of datums. In that case, there could possibly be one in the library that is a close match to your datum or you could define your own datum by selecting "Add Datum" and setting the datum parameters. Thank you very much. Problem is solved!! !